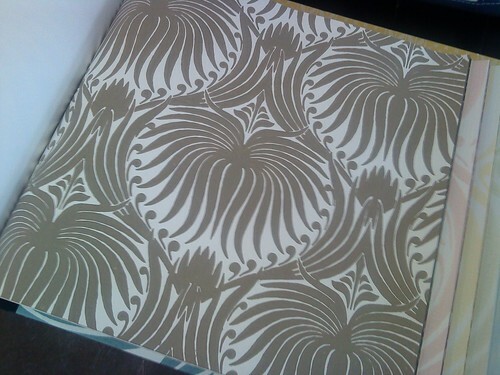 I went wallpaper hunting this morning. After a lot of searching I found an adorable stripe in a coraley pink from Schumacher but it just felt too flat. I started to rethink my tiny pink stripe plan. I skipped over to the Farrow & Ball books. Great colors, textures, and designs. Every design feels so perfect for my old little house. I’ve checked out Lotus Papers (above and below) a billion times online. In person it’s a hundred times lovelier. How amazing in a larger room or entryway? Now what am I going to do in my tiny little room? Maybe not stripes…maybe stripe curtains? p.s. 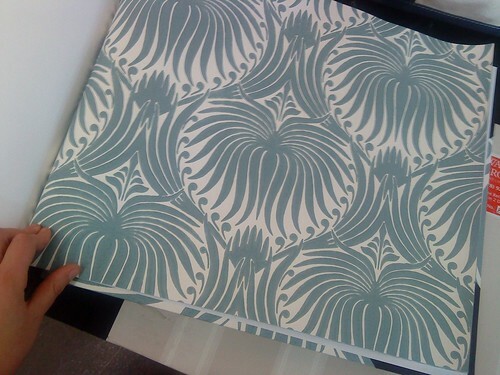 Jenni from Department of Interior just tweeted me a photo of Lotus Paper installed in an entryway, gorgeous. See here. OH WOW…I love these! Going to look at their site, thanks! Stunning paper. I am a sucker for two tone prints. Ohh very neat – great purchase! …and would also make a great design for a quilting fabric!